Confused by the subprime crisis? Let some stick figures explain it to you. I loved Nickel & Dimed. This book is a response to it, showing how possible it is to get out of poverty if you are at all determined to do so. A very interesting call-in discussion about atheism and faith. Another Buffet interview, from business students. Good questions, great answers. Can the psychologist beat the mathematicians? An update on the Netflix contest. Yes, itâ€™s torture. See some new photos. The effects of bottom trawling, as seen from space. Bush is a conservative, eh? Here’s another typical budget from our small government champion. If President Bush’s budget for fiscal 2009 is approved in its current form, U.S. government spending will have increased by more than $1.2 trillion since President Clinton left office; adjusted for inflation, that’s a 35% increase. Bush has increased spending at three times the rate Clinton did when he was president, and also has given us the biggest defense budget since World War II — and that’s regularly budgeted defense spending, not counting funding for the wars in Iraq and Afghanistan. Yet, as in the past, Bush is proud of his fiscal discipline and projects the end of the deficit in 2012. And as I always have to point out, that final bar showing 10 is for Japan, not America. 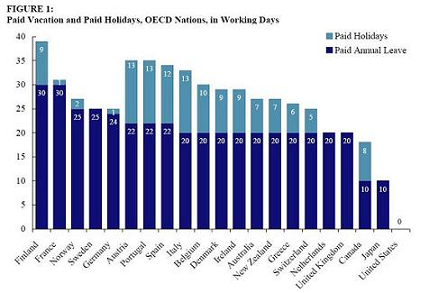 America has no bar, because Americans, alone in the developed world, aren’t guaranteed even one day of paid vacation. Almost three years ago Jabley got Vonage. He’s my guinea pig for cool new tech toys, and I’ve wanted it since then. The delay for most of that time has been over the 911 issue. Cel phones are actually tracking you all the time to know where you are, but Vonage doesn’t. The phone number you have may not be related to your geography at all, Jabley cites people using American phone numbers even though they’re based in India. This means that if you dial 911, you might not get the right service. How smart are we? We finally realized that Vonage is for the house, it won’t replace our cel phone. We can tell Vonage with the right 911 is, and it will always be right. Duh. So I called and got it. It works perfectly. Reception is clear as a bell, all the features I could ask for, long distance is no distance, etc. I’m especially glad that we kept our old phone number. It will cut our phone bill in half, that’s $300 a year. I even got two months free by putting Jabley as a referral. Activation, buying the physical unit, shipping it me: $50. I naively pictured that all our existing phones would continue to work. In reality, Vonage is a physical unit that the phones must plug into. That means we had to buy a phone system with a master unit and a few slaves. And these new ones can’t be outside which means our outdoor phone is gone. $99. TiVo: TiVo uses the phone system to update itself. Although there are ways to hook it into Vonage and dial, it makes more sense to connect it to the home network. I broke down and bought the wireless adapter: $65, thank you Circuit City. After all this saving money, I’m over $200 in the hole! You and the guys are getting some dinner. You have two choices. One is pizza. The other is tofu sandwiches. Of course, you all want pizza. Some people want mushrooms, some want onions on top. The arguments start. You compare the relative merits of both toppings. You question everyones knowledge. You question their motivations. You question their sanity. The more you talk about it, the bigger the differences get. The drug connotations of mushrooms are examined. Breath freshness of the onion lovers is tested. The arguments go on. But one thing everyone can agree on, no one wants the tofu sandwich. As long as we get pizza instead of tofu, I’m basically happy. I like onion over mushrooms, but either is fine by me. This is a very good article on the media narratives surrounding Hillary and Obama. Worthy enough of your time to be a standalone post. A Walk in the Woods (Bill Bryson): I reread this for the second time. Still the funniest travel book you’ve ever read in your life. Bill Bryson is your average middle-aged person, who decides one day that he wants to hike the Appalachian Trail. After all, he takes good long walks every day, this will be just a lot of them put together, right? Much hilarity ensues. All Bryson books are good, but this one is the best. Since Then (David Crosby): This is David Crobsy’s second autobiography. Since he wrote the first one, enough has happened to make a whole second volume. Having read it, I agree. This guy is amazing. He can’t go ten days without almost dying, almost killing someone, becoming a millionaire, donating sperm for famous lesbians, going bankrupt, going homeless, almost dying again, finding long lost children, forming a band with said children, and so on. The man has lived. Harry Potter and the Deathly Hallows (J.K. Rowling): Awesome! It’s hard to review without giving away any spoilers, so I can’t say much. I was very impressed how all the plot twists were completely fair. Everything you knew was wrong, but for valid reasons, she never deliberately led you to believe one thing and then set you up for the twists, the twists were natural. I’ll stop there. The Black Swan: (Nick Taleb):This one has gotten a lot of press. Black Swan events are those that are so far outside normal probability we don’t think about them in the normal course of life. Hurricanes are normal events. Katrina destroying New Orleans is very improbable, perhaps a black swan. The transformative power of the Internet, 9/11, these are Black Swan events. Taleb’s got an attitude. You don’t often read a book centered on mathematics that has such a strong point of view. It’s very refreshing. I intended to read his other book, Fooled by Randomess. The Golden Compass (Phillip Pullman):I had intended to make a standalone post about this book. It’s fantastic. I have recently been re-reading some of the kids books I used to love. Some of them stand up, some don’t. The Dark is Rising stinks. As an adult, it’s laughably dumb. Pullman’s stuff is intelligent. The first two books of this trilogy were incredibly well done. They are childrens books, but very readable by adults. If you read just the first book, you will have a hard time understanding why the Right is so mad about this. Once you get into the trilogy, it is very clear. I’ll leave it at that to avoid spoilage. 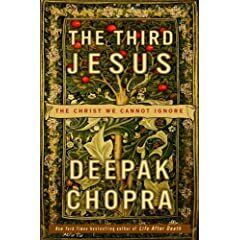 Sadly, the third book is simply ridiculous. It has cool moments here and there, but can’t deliver on the promise of the first two books. Empire Falls (Richard Russo): I love Richard Russo. I first learned about him from the movie Nobody’s Fool (with Paul Newman), which had such an interesting style and feel to it, unlike any other movie I’d seen. I finished Empire Falls last night, I was up until 1:00 am finishing it out. It won the Pulitzer Prize, and deservedly so. This is what got me thinking about Pulitzer Prize books. Soon I Shall be Invincible (Austin Grossman): Actually, I haven’t read this yet, but it will be on top of my next Amazon order. Most of you know I used to be very tight with Austin, and I can confidently say, if he wrote it, it’s good. (The other reviewers are all saying the same thing by the way, not just me.) Update: Yes, it’s very very good! Sacred Games (Vikram Chandra): This is another one of those books where talking about the plot doesn’t tell you much about the book. A policeman in India successfully captures/kills the local mafia chief. Chapters alternate between the stories of the policeman and the gangster, and of course more is revealed. Whatever. It’s a wonderful book to read. Full of life and atmosphere, all kinds of interesting characters brewing in an enormous soup of life. I’ve never been to India, and yet I feel like I took a long trip there.